Seren, Doc and Adam in this episode review the current Inhumans titles – Marvel Rising: Omega #1, Death of the Inhumans #3, Ms Marvel #34 and Fantastic Four #2. Episode 48 – The Fantastic Four Return! 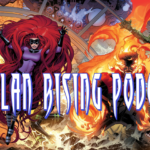 In this episode we review the #1 of Fantastic Four by Dan Slott and Sara Pichelli, Death of The Inhumans #2 by Donny Cates and Ariel Olivetti which we have to say has some interesting ramifications for the Inhumans and Marvel Rising Ms Marvel/Squirrel Girl #1 (why can’t they number these Marvel Rising #1 – #4? Come on Marvel…).